Eagle Lake Maine, a popular outdoor recreational destination, is part of the Fish River Chain of Lakes. In the midst of a cold winter in 1839, a posse of 200 men were marching toward the Aroostook War from Bangor when they noticed a multitude of white-headed eagles flocking around a 18-mile-long lake. They named it Eagle Lake, and just one year later, the first settlers arrived in the region. Over the next few decades, the town grew quickly, thanks in large part to the construction of saw and grist mills and the arrival of the Fish River Railroad in 1902. Today, this scenic region and its neighboring towns – Portage, Soldier Pond, Wallagrass and Winterville – are part of the Fish River Chain of Lakes, a popular vacation destination in both summer and winter. Recreation in the region centers around Eagle Lake; this scenic body of water encompasses 5,581 acres and is 138 feet deep in parts, making it the perfect backdrop for boating, sailing, canoeing, kayaking, and fishing – and ice-fishing — for salmon and trout. Trappers and hunters can try their luck at catching some of the many wildlife species that call the Eagle Lake region home, such as black bear, moose, rabbits, ruffled grouse and white-tail deer. A number of licensed Maine registered guides provide fishing and hunting adventures. Winter visitors won’t want to miss one of the area’s biggest events: The Eagle Lake 100-Mile Sled Dog Race. This annual race attracts teams and spectators from around the U.S. and Canada and includes a winter festival. Nearby, the Dickwood Lake Wildlife Management Area contains 4,360 wooded acres, including the 96-acre lake at its center. This wildlife refuge is crisscrossed with trails perfect for hiking, mountain biking, ATV-ing and cross-country skiing and snowmobiling in the colder months. Just east of Eagle Lake, Square Lake also offers excellent fishing and boating opportunities. This 8,150 acre lake is 122 feet, making it a great place to cast for trout. Neighboring Cross Lake is also a popular fishing and camping spot. Just east of Cross Lake, shallow Mud Lake – only about 20 feet deep — and long, deep Long Lake make up the rest of the Fish River chain. Portage Lake takes its name from the 2,474-acre lake that sits at the center of town. This shallow lake – it only reaches depths of about 25 feet – and its surrounding forest first drew settlers, a group of Canadian lumbermen, in 1844. Today, the town and lake draw visitors year-round for camping, paddling, swimming, fishing and boating in summer, and ice-fishing, snowshoeing, cross-country skiing and snowmobiling in winter. Other attractions in the area include the Portage Lake Golf Course, a nine-hole public course, and hiking trails on Haystack and Hedgehog Mountains. 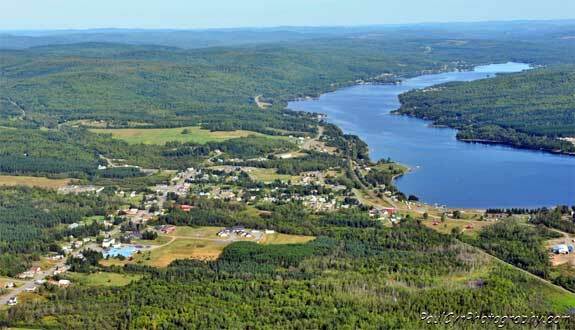 Just a few miles from the Canadian border, the town of Wallagrass sits near Soldier Pond. This calm, clear lake is the perfect place to spend a quiet morning kayaking or canoeing. Tiny Winterville sits near Saint Froid Lake. This 2,400-acre lake is about 6 miles long and reaches depths up to 114 feet. This clear, cold lake is known for its excellent cold-water fishing and tends to remain uncrowded, even in summer. A few miles southwest of Winterville, Fish River Lake is the westernmost lake in the Fish River chain. This scenic lake encompasses 2,642 acres and reaches depths to 46 feet. It’s an excellent place for paddling, swimming and bird watching. Resident feathered species include common terns, loons, bald eagles and double-crested cormorants. Lodging choices abound in the Eagle Lake area. Campgrounds provide the chance to rough it in a tent or RV, while lakeside cottages provide amazing views. Cozy bed and breakfasts — some set in historic homes — offer the opportunity to get to know the region from the locals who know it best, while rustic lodges allow you to get out into that famous Aroostook wilderness. There are also several motor inns, motels and hotels available. You’re sure to work up an appetite after a fun day spent adventuring in the Eagle Lake region. Luckily, the area’s restaurants will keep you satisfied. Visit the following directories to find lodging, dining, attractions, shops, services and recreational activities in the Eagle Lake, Maine area.